A skill we are working on with our girls is planning. It's a skill that is very beneficial in life. Take the big picture and break it down into smaller steps and you won't feel so overwhelmed when it comes to tackling the task at hand. It also helps things flow more easily and relieves some anxiety and stress. Our troop have begun to plan their own meetings. We gave them the task of providing us a list of activities they would be completing and supplies they need. Easy enough, I thought. After a year of getting plans that took quite a bit of my time to decipher and going back and forth on what requirements were missed, I decided I needed to share some secrets on planning. It will save both them and me time in the long run. For years, when I was planning meetings I had just broken it down and typed it up and within a matter of 30 minutes or less... I had a plan that worked wonderfully. It also comes in handy when you are sick or have a family emergency and someone else has to step up and lead the meeting in your absence. Yep. Life happens! This is the way it works... You can save the Blank Planning Sheet (listed below). Update the header and your badge/patch/activity will appear on every page. Type in the name of the badge/patch, date, who is leading, and the steps. For each step, you have a row in the table. List the requirement number, requirement description, activity with instructions, estimated time (if you want... I do this to make sure I have enough and not too much planned for the length of the meeting), Leader, and Supplies List. Requirement #: I list this, so I can make sure I have all my steps done. If you are splitting a badge across a couple meetings, this will save you so much time. You can reference both meeting outlines and make sure you have all of them covered. Requirement Description: I list this piece of information so I can quickly reference why we are doing what we're doing when we're doing it. Yes. I know they are listed above, but sometimes you have multiple pages and if you are fortunate, you can hand a page to someone else to lead. They have all the information about the activity they need. Activity: This is self-explanatory. You need to know what you are doing. I will add that if it's a rather long description, sometimes I put "See Activity Sheet" or something. Estimated Time: You know how long your meetings are, so why not track the time for each thing to make sure you don't have too much or too little planned. You can always let things run over time or under time. Leader: With the girls leading meetings and splitting badges, it helps to know who is doing what. So, I list it or have them list it. Supplies: Always good to know what you need. I try to keep "fluff" out of this column, so when I go shopping for supplies or it's time to gather supplies, I can quickly look down a list of things needed. I hope this helps save time and energy. If your girls are still young and aren't at the point of planning the whole meeting, then use it for yourself and for assigning other volunteers tasks at your meetings! Completed plans are also great to start building and saving and sharing with your Leader friends... they will give you great big hugs. Note: You can also use this for Event Planning... Instead of requirements to complete, use it for Stations at your event. I have marked down SEVEN of the BCGPatches.com patches by 20%. All prices have been adjusted and are waiting for your to order... and YES... shipping is still included in the price. Sale ends March 31, 2017 or while supplies last (inventory in the store is correct. If you see it, it's available). I know I've referenced this song before and I may again, so hopefully you like it. The past month or so has been all about cookies. We have been taking orders, delivering, transporting, shuffling, selling, boothing, and getting really sick of them (just being honest). I think at this point, all the adults and girls are tired of cookie season. We still have another 2 weeks to go, but our troop... is done. This morning, I made an early day run (like prior to 7am!) to a friend's house to trade out this for that to fill some orders from parents. On the way down the street to turn around, I was thinking about the sacrifices we make as Troop Leaders. We give up time with family, friends, and ourselves. 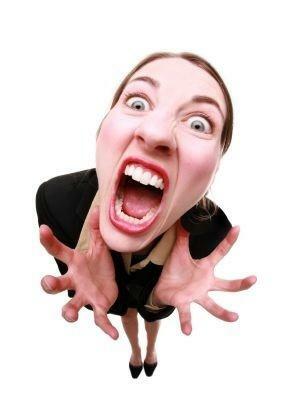 We become stressed, overwhelmed, snippy, and down right mean to those we love the most at times, too (talk to my husband... he'll tell you I am not perfect..) ... myself included. I really try to keep myself in check... but it's hard when you have a million things to do, badges to sew on, cookies to sort, meetings to prepare, trips to plan, and then all the normal "stuff" we do. I turned my car on and the song by Tim McGraw was playing.. "Humble and Kind". It was at that part in the song where it says "Always stay humble and kind"... "when you get to where you are going, don't forget to turn around and help the next one in line." I have to say it stopped me in my mental tracks and spoke to my heart. The girls that I've watched grow and mature and take on responsibility and laugh and plan... they are why. They are worth the early morning cookie run, the late night badge sewing session, the crazy week full of here and there activities, the booked calendars, and the sometimes unrecognized sacrifices. 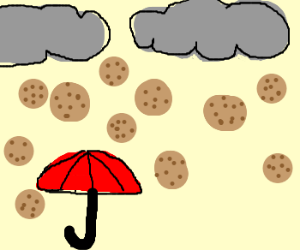 In the midst of the cookie storm.. take a moment and remember why we do it. It isn't about the money for the troop. It isn't about being the top seller. It's not about being recognized for the things we do. It's about setting the example for the next generation. They may not see it today... but they will see it. They'll understand it. They'll know. Someone cared enough about them and the world we live in to stand up and say "Yes. I will do this." Thank you, to all the volunteers who Believe in Girls. It really is ToGetHer There! One thing you most likely don't realize, unless you read my entire blog daily and compare all the content, is that I do read and listen to comments. Comments on older posts are read. Posts are reviewed. Updates and improvements are made. Today, I want to point you in the direction of a Junior Badge, Independence. I had a comment about the Bad Habit Tracker. You wanted to see it. I'm going to be honest and tell you that post was made a few years ago and I wasn't always the best at sharing resources... sheer laziness on my part. Since then, I've set up the Blog Shares folder on my Google Drive and links galore are going to it. So... as requested... the Bad Habit Tracker has been added to the drive in Word format. you can download it, modify it, use it, ignore it, and do whatever. Just please remember to give credit where credit is due. As a leader, I'm always looking for easy things to fill the time and something that creates a memory. That is the hope for the Just Sing Patch Program. The 6 page Just Sing program guide has some tried and true favorite songs of my girls from our own meetings and larger events. Yes, I included Tom the Toad and I'll just apologize in advance. That toad will be the death of me, yet. For the past 5 years for our day camp, I lead songs. If Tom isn't in the book, I get asked why and if we can sing it anyway. If Tom is in the book, I hear the begging of small scouts every single day to sing. Why Tom is so loved is beyond me... but, he's in program guide for Just Sing... a tribute to all the pleading little girls I've heard for the past 5 years. 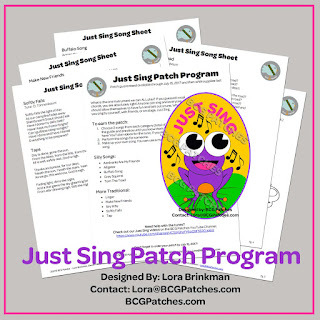 Just Sing is a quick and easy patch program you can work on during the time in the meeting when you flew threw everything else or when you are waiting for parents to arrive. Sing a song or two. Share some laughs. Earn a patch... with Tom the Toad and all his other friends. Not all the songs are silly, mind you. I included my favorite traditional songs that we've sang. Linger has a special place in the heart of my stepdaughter, as we sang it as a send off for her older sister leaving on a missions trips. Say Why is in there because it's just the perfect way to end camp each year. It's also a beautiful song for graduating girls, bridging, end of a special event, or even a troop year. Taps... well... this is a song that I had no idea had words until I became involved with scouting and so I'm hoping I'm not alone in the lack of knowledge. I'm spreading the word. There are words to Taps and they are thought provoking. If you promise not to judge, laugh, or leave snarky comments... 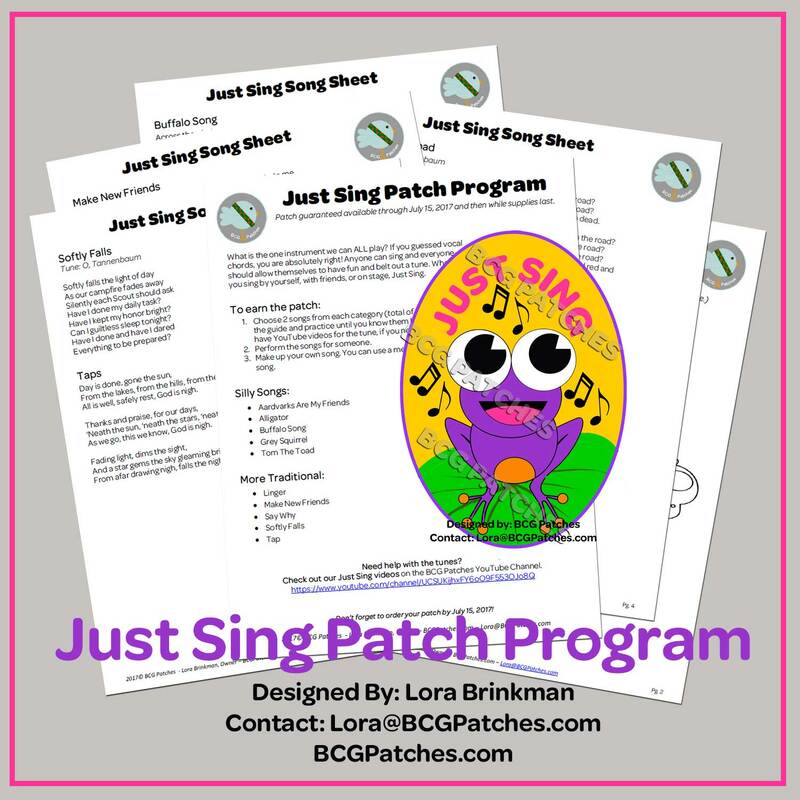 I invite you to check out the BCG Patches YouTube channel, as my girl and I have added videos for sing-a-longs for each song. Yes... we Just Sing and are proud of it. The Just Sing patch will be available through July 15, 2017 and you can order it now in the store. It's been quiet around the blog for a couple weeks.. you know why? But, be watching this week for a couple fun announcements. If you haven't checked out the BCG Patches store... please do. Sign up for our newsletter, too. They go out on the 15th and include information about the latest patch releases. Chat soon... after I dig myself out of the cookie cases and resume a normal home free of the sweet treats!